The Codex Borgia has been long recognized as one of the most important codices written before the Spanish Conquest that survived Spanish flames. Most of the content of the Borgia has been deciphered and it is very clear that it contains important information related to the calendar including: a complete tonalpohualli with all 260 days laid out, a birth almanac, a marriage almanac, and various pages showing the Teteo and animals associated with each day-sign and number that are combined to make tonallis. However, Pages 27-46 are more obscure and have escaped decipherment until now. Over the years, various scholars including Anthony Aveni, Eduard Seler, and Elizabeth Hill Boone have offered their own interpretations of these pages. Ruben Ochoa first discovered that if you use the correlation date 1-coatl (which corresponds to the fall of Tenochtitlan on August 13th, 1521) to continue the calendar, a natural pattern arises in which a day after the observable spring equinox in Tenochtitlan on 3/12/1522, 4-Cozcacuauhtli follows in the year 4-Tochtli. 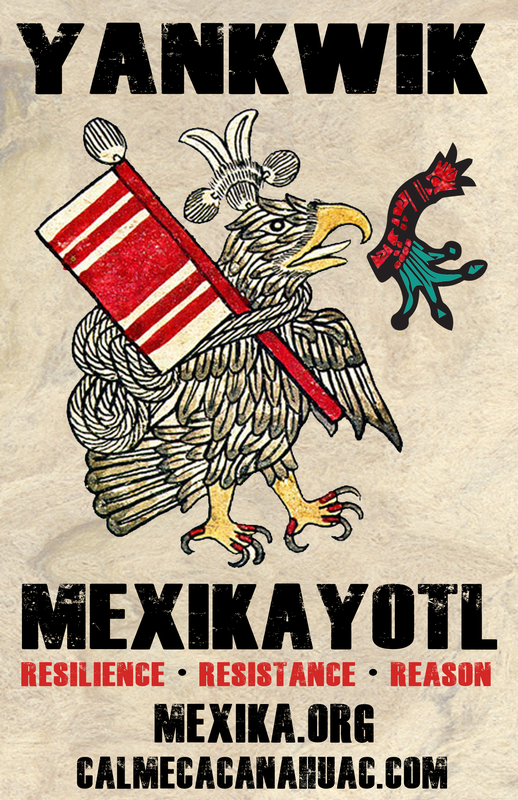 If you count backwards from 1-coatl, the day after the spring equinox is 3-Ozomahtli, in the year 3-Calli (1521). As he continued counting forward, he noticed that the day after the observable spring equinox in the year 1523 falls on the day 5-Cipactli in the year 5-Acatl. When he counted forward to 1524, he noticed that the day after the observable spring equinox is 6-Miquiztli in the year 6-Tecpatl. Ochoa had confirmed a pattern laid out by Zelia Nuttal (and other Mexican scholars) over 100 years earlier. Ochoa knew he was on to something but the significance of this pattern was confirmed when he noticed this exact pattern on page 27 of the Codex Borgia. On this page, 1-Ozomahtli was sitting next to 1-Calli, 1-Miquiztli next to 1-Tecpatl, 1-Tochtli next to 1-Cozcacuauhtli, and 1-Cipactli next to 1-Acatl. page 27 of the codex borgia. This is a reconstructed page. 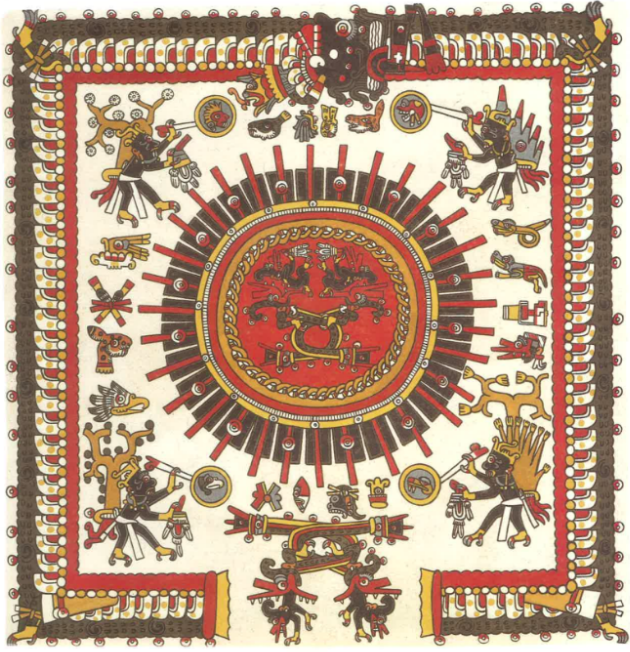 In the original, the acatl and the tochtli signs are shown with the same year bearers that appear behind the tecpatl and calli signs above. Ochoa was the first to discover then that this page was literally instructing the reader on how to sync the tonalpohualli to the xihuitl. Read literally, it would say, in 1-acatl years, the tonalpohualli must start on 1-cipactli, in 1-tecpatl years, the tonalpohualli must start on 1-miquiztli, in 1-calli years, the tonalpohualli must start on the day 1-ozomahtli, and in 1-tochtli years, the tonalpohualli must start on 1-cozcacuauhtli. As shown above, this pattern continues as the four year bearers (tecpatl, acatl, calli, and tochtli) cycle through the 13 numerals for 52 years. Further confirmation can be found on page 30 of the Codex Borgia. In this scene, Tlaloc is literally giving birth to the new year in four different instances, on the days ozomahtli, miquiztli, cozcacuauhtli, and cipactli! We know this because all of the Tlalocs are holding the same exact tool that all of the Teteoh are holding in the first scene of the birth almanacs. We also know that this scene is intended to depict the spring equinox because the following three images show the summer solstice, fall equinox, and winter solstice. The days on those scenes also fall exactly one day after each of the solstices and equinoxes showing the Azteca/Mexica is inextricably tied to these astronomical events. This should not be a surprise considering the vast amount of astronomical monuments located throughout Mexico and Central America that are aligned exactly to the solstices and equinoxes. As a result, time keepers in Pre-Columbian times likely used a combination of books like the Borgia and the astronomical monuments to calibrate their calendars. For many years, scholars believed that there were no Pre-Columbian codices that depicted the months (or Veintenas). This made it difficult to calibrate the Xiuhpohualli since one had to rely on secondary sources to accomplish this task (read more about why this is a recipe for disaster here). 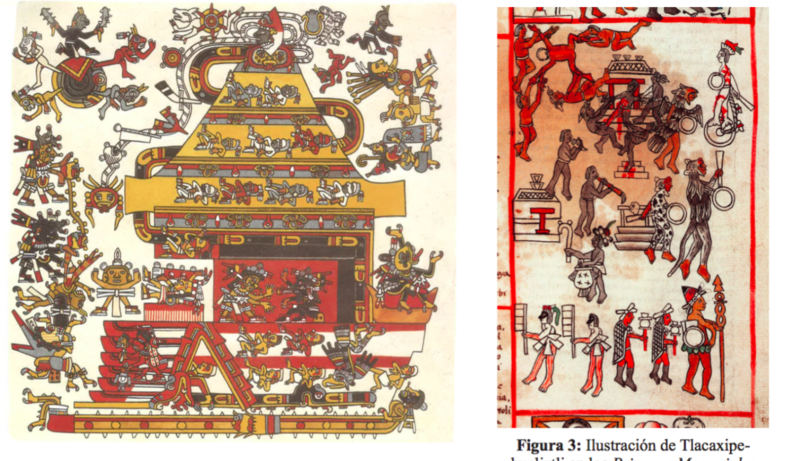 In 2015, Susan Milbrath made a compelling argument that pages 33-46 of the Codex Borgia depict months in the Xiuhpohualli (click here to read her full study). Her main source of evidence comes from the similarities in pages between the months depicted in the Primeros Memoriales (a primary source written by Native scribes shortly after the spanish conquest) and this section of the Codex Borgia. If we accept her proposal that these pages depict months, we can use it to calibrate the Xiuhpohualli. 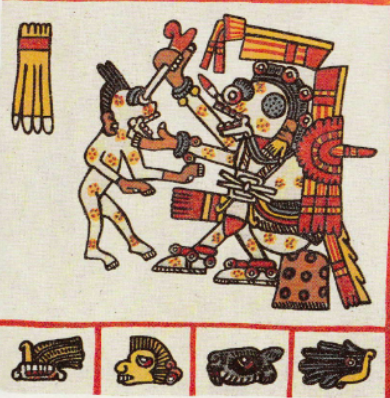 At the beginning of the section on page 33, we find that the first month depicted is Tlacaxipehualiztli. If the months are shown in sequential order, we can firmly place Tlacaxipehualiztli as the first month of the Xiuhpohualli. 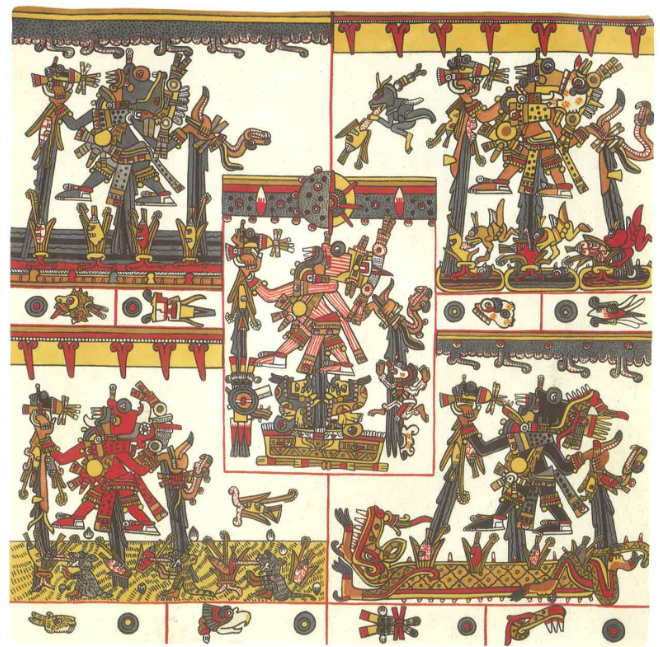 When compared side by side, it becomes clear that Milbrath was indeed correct and that page 33 of the Codex Borgia does in fact depict the month of Tlacaxipehualiztli. Both scenes contain various people participating in a festival while holding various objects such as pantlis, weapons, and incense bags. There are also priests performing a sacrifice in both scenes. The most important piece of evidence however in the scenes that ties them to the month of Tlacaxipehualiztli is the presence of Xipe Totec because Xipe Totec is the Teteoh that Tlacaxipehualiztli is dedicated to consistently throughout all primary sources. An additional component of the Borgia scene is extremely important for the correlation of the Xiuhpohualli. On the top of Teocalli, there is a priest dressed as Itztli who is observing the sun. Considering the new year begins a day after the spring equinox according to the tonalpohualli correlation and Indigenous people made astronomical structures to mark the equinox all over Mexico, this image firmly places Tlacaxipehualiztli as the first month of the year, one day after the spring equinox. Although pages 27-46 escaped decipherment for many years, we now that these pages are designed to align the tonalpohualli and xiuhpohualli calendars with the spring equinox. The Codex Borgia as a whole then would contain everything a Tonalpoque would need to 1. calibrate their calendars, 2. assign and interpret tonallis to newborn babies, and 3. interpret tonalli fates for marriages. The Codex Borgia then is the single-most important codex to have for those who are studying the calendar and we are incredibly lucky it escaped Spanish flames.